New Wave Domesticity: Canning Starter Package Giveaway! This week, I've talked a lot about canning and I really hope that it has gotten you inspired to start your own canning projects! To help, I've teamed up with Progressive International to offer one of my readers the chance to win some of the tools I talked about yesterday in this amazing Canning Starter Package! Progressive 3 Piece Canning Essentials Tool Kit - Comes with a a jar grabber - an absolute a must have for any canner to help you safely remove jars from boiling water bath; a lid lifter with magnetic magic to get your lids out of hot water bath safely and easily; and a jar funnel to help you fill your jars quickly and with minimal mess, not only that, but this the thing that makes this funnel really special is that it has marks to show you exactly how much headspace you are leaving to a perfect pour every single time! Progressive Reversible Stainless Steel Canning Rack: This beauty fits in most 16qt and larger stockpots, so it is perfect & compact to store and bring out on your canning project days. It is made of stainless steel, so it won't rust. The best part? It is reversible so one side will fit 4 quart jars or just give it a flip to perfectly fit 7 half pints. 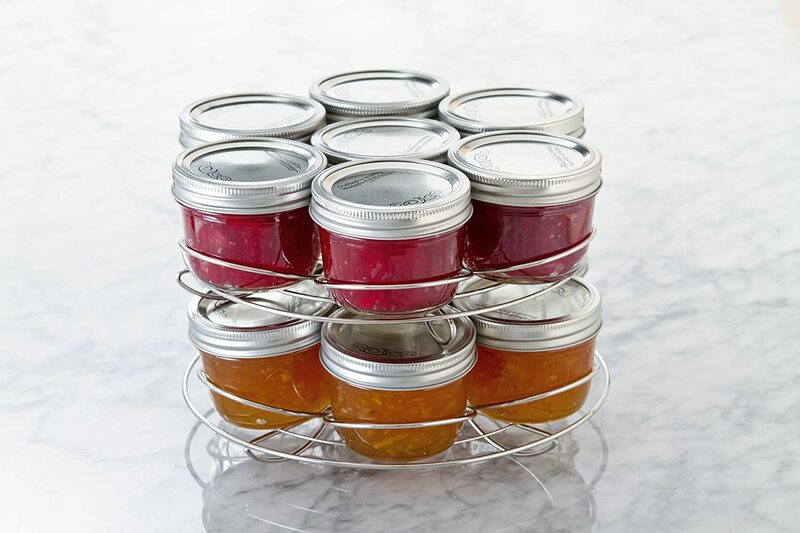 AND it is stackable, so you can use multiple racks to process up to 14 jars at a time! 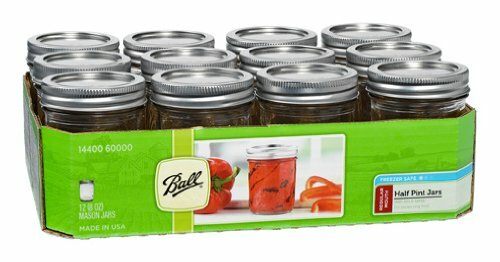 1 Dozen Half-Pint Ball Mason Jars - These are my jars of choice. They are perfect for pretty much any canning project from pickles to jams! Just add fruit or veggies and you have everything you need to get started with canning...or to add to your current stash of canning supplies! Thank you so much for entering and following along! Good luck! What an awesome giveaway!!! I really REALLY want to make some strawberry jam this year. What a nice way to round-off your canning posts. Thanks! Wow, this is great! Your series is totally getting me excited about canning! This is so rad! Much nicer than the jar grabber that plops the jars into boiling water and burns me. I dream of making jams and salsas! I make raspberry and strawberry jam. I just got back to the States from Japan and looking into canning my own tomatoes! This would be perfect! I want to learn to can pickles! Oh good! I have a pickling basics post in the works that I will post really soon! I hope it will help you and get you inspired to try it out! I have never canned anything but would love to can pickles. This looks like it would be a great way to learn how to make jams & jelly. It would be good to give as a gift. Thanks for the cool contest. I can my own jams and jellies every year. I would love to can apple butter! I know how to make it from scratch but I haven't learned the art of canning yet. I can't wait to can tomatos and peaches! I'm just starting to branch out beyond jellies, spiced blueberry jam being my favorite tried and true recipe. I'm looking forward to canning tomatoes this year! I would LOVE that recipe if you are up for sharing it! I got a blueberry relish that is kind of spiced and vinegar-y at a canning swap and I am so in love with it...I eat it on yogurt constantly! I would love to try something similar this year! I'd love to learn how to can the "tomato relish" my grandmother made! Oh my gosh! Grandma recipes are the BEST! Tried and true and full of love! I would be grateful to learn how to can tomatoes. Thanks for the comment! Would you like to learn to make sauce? Or do whole tomatoes? My garden will be overflowing with tomatoes in a few months and I would love to share my tomato recipes for canning once they get going! I want to can cherry preserves the most. I would most like to can summer veggies. I do a lot of blackberry jam or sauces with blackberries (like with chipotle) because I've got a bunch of blackberry vines! Tomatoes! I love them and use them in everything. I have tried the fridge cucumbers and peppers and I would love to start canning. With my new garden! My husband and I make pepper jelly together every year out of a mixture of different peppers. We have so much fun doing it together, and everyone in our family loves it, so we try to make enough for everyone to last all year. Jams and jellies! I would also love to make put up some beans, and make different varieties of pickles. I love canning homemade salsa! I love to make relishes. Our current favorite is a sweet and sour chow chow relish. Planning with my mom to make our next batch now. Awesome giveaway. I would love to learn to can jams, fruits and vegetables. I want to can tomatoes and other veggies! we can everything out of the garden, but I thin my favorite thing to can is meat. It is so nice to can up a bunch of beef or deer and during the winter just open a can, thicken the juices and serve over rice. All the work is done upfront! I've never canned anything, but growing up, my great grandmother always did. We had a huge garden, and she canned everything--tomatoes, green beans, pickles, etc. I would LOVE to win this! I would like to learn how to can jam. I like to can peaches and tomato sauce. I've never made chutney, but I want to try it this fall. I would love to learn how to can green beans-a family favorite and pickles for my hubby! I'd love to try pickles!! I'd like to can some tomatoes. I am just learning how to can and tis would help alot. I would like to learn how to can jelly. 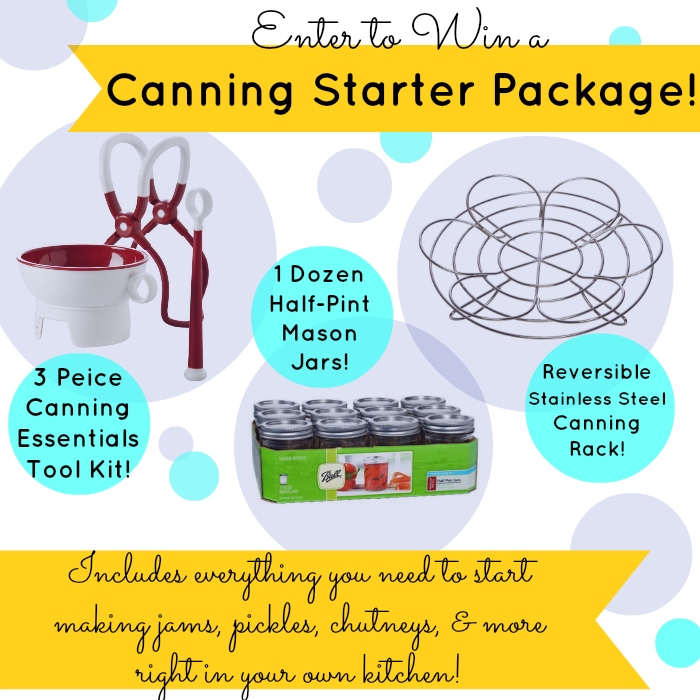 Sarah, this is an awesome Canning Starter Giveaway package! My grandmother used to can all the time but I never took the time to learn how from her. This will be a great way to get started. I would love to can some strawberry jam. I am also looking to learn how to can veggies. Thanks!